After the poor game at Everton, we’re back in Europe, and this time vs. Napoli of Italy’s Serie A. This was, of course, the hardest draw in the competition – though I feel whoever wins this will go on to win the competition. However, despite the difficulty, I don’t see why we cannot progress. Much has been said of how Napoli boss Carlo Ancelotti was touted by Arsene Wenger to replace him as our manager. And he naturally knows the English football scene following his time at Chelsea. But then despite his and Napoli’s qualities, we can get the win here. Napoli has been Juventus’s strongest challenger in Serie A lately. Whilst not as big historically as Inter or AC Milan, they have surpassed the Milanese duo in league performances, much of which was under current Chelsea boss Maurizio Sarri. Of course, they do have history, given the great Diego Maradona played for them. But they lack the Scudettos and European successes of the Milan clubs, and the Grand Old Lady itself of Turin itself. Ancelotti has taken this on, and whilst Juve with Ronaldo et al. (and soon Ramsey) has La Scudetto in the bag, they will want a trophy along with ensured Champions League qualification via the league. So this certainly won’t be easy. Koulibaly is a much-lauded centre-back, and one who could do a sound job at any top English side –or world club side for that matter. Our attackers, despite their qualities, should relish testing their mettle against him. Ancelotti generally favours an open style, but I feel he will get his side to be cautious here and try and limit our attacking potential. He would want an away goal, but would be confident playing us at their ground. A gung-ho approach wouldn’t be prudent since this would suit us. If anything, how Atletico Madrid played us would be a good template for Napoli, since they got a 1-1 draw, but in truth this was due to our poor finishing and defensive errors. Had we converted the chances we created, we’d have won that game pretty comfortably. Napoli though must balance defensiveness with attacking qualities, and a 0-0 wouldn’t be bad for them, but in some ways better for us. As for us, well we don’t need a repeat of the Everton game. We need to be shored up at the back, and if we can play as many of our starters as possible, then so be it. What cost us vs. Everton, in my view primarily, was a weak midfield. Whilst Napoli is a different outfit, and we need to adapt to their unique traits, we shouldn’t go with this midfield pattern. As Torreira is back, it’s imperative that he starts. If Xhaka is fit, then play him. And Ramsey, if he is fit, should start again. I feel we need to harry Napoli, get in their faces, make them uncomfortable, and take our chances when presented. Cech, Monreal, Sokratis, Mustafi, Jenkinson, Ramsey, Torreira, Xhaka, Ozil, Lacazette, Aubameyang. If Xhaka isn’t ready, then Guendouzi or Maitland-Niles should feature. Sokratis’s Premier League suspension doesn’t apply here, so it will be his last game for us in a while. Mustafi is much-maligned, and a good game here would further compound that he’s not at the level. But we need him, given Mavropanos isn’t that experienced and hasn’t got much game time this season. 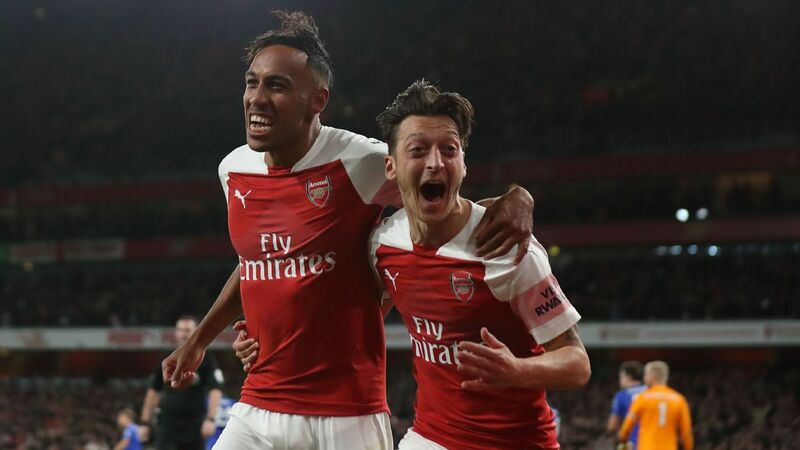 The midfield three would combat Napoli, and Ozil, Laca, and Auba would provide pace and insight to trouble their defence. Auba hasn’t scored much lately, but he can silence the flat-track bully motive by scoring here. Laca has been in my view our best player this season – and he can cement this beyond doubt with another display. Ozil would, in a way like his compatriot Mustafi, heighten dismay if he played well in this game. We know of his quality, but he’s way too inconsistent. The midfield three have to work hard, and create as much as hassle Napoli. And our defenders cannot afford any errors, and all must be sharp in their individual and collective performances. And our head coach, “ej jefe” Senor Emery, must get it right tactically. To be fair, he has done for the most part this season. However, this cost us vs. Everton, and it should be key for us here. We dug ourselves out of holes in BATE Borisov and Stade Rennais, but a hole created here may be too big to leap out of. A good game plan, as well as no critical errors, are both of paramount importance. I believe we can win, but given our defence, I think we may concede. However, even with conceding an away goal, I feel this could be enough to go Napoli and get progression. Whilst Chelsea is the other top side left in the competition, I feel that if we beat Napoli, or if they beat us, then the winner of this season’s Europa League is secured. Ancelotti and Emery have the nous to defeat Sarri, since he only has one way of playing. But then we have to beat the Italians first, before we can think of perhaps defeating another Italian albeit based in London.